The revival of the Volkswagen Beetle, now two decades old, appears to be ending. Though never as good in its time period as the original, an icon dating back to 1949, the revived product launched in 1998 suggested easygoing fun. But the New Beetle is old now, headed for extinction. 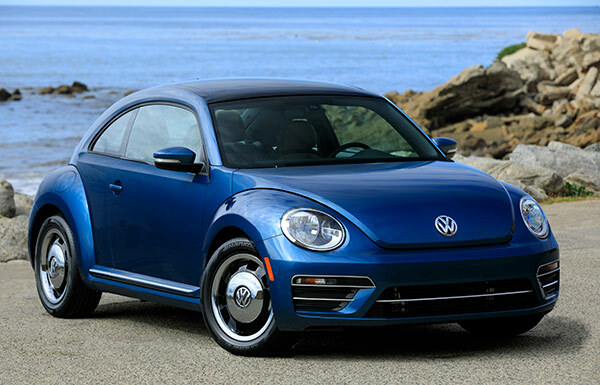 Last reworked for the 2012 model year, the 2018 Beetle is available in a new Coast trim level. Under the hood, engine possibilities have been reduced to one: a new turbocharged 2.0-liter four. The old R-line engine is gone. New Style & Comfort, Lighting, and Premium option groups are available. Volkswagen also offers a new warranty, valid for six years or 72,000 miles. Beetles now come in four trim levels: S, Coast, SE, and taller-riding Dune. All have front-wheel drive. The Coast version is available in a Deep Sea Teal hue. Inside is a surfin’ themed dashboard with wood-look pad, above rugged floor mats. Each version is available as a hatchback coupe or a convertible. Substituting for the previous 1.8-liter four-cylinder engine, the modestly more powerful and economical 2.0-liter rendition develops 174 horsepower and 184 pound-feet of torque. A smooth-shifting 6-speed automatic is the sole transmission. Each Beetle is amply equipped, though advanced safety systems are lacking. A rearview camera is standard. Coast and SE versions get blind-spot monitoring. Parking sensors are standard on Dune models, and optional for SE. Crash-test scores are incomplete. The National Highway Traffic Safety Administration gave the 2017 Beetle a five-star rating overall and for side-impact, but four-star for the frontal-impact incident. For 2018 models, the agency lists only the four-star frontal-impact score. Convertibles have not been crash-tested for several years. The Insurance Institute for Highway Safety gives the driver’s side of the 2018 hatchback a Marginal rating for the small-overlap frontal-impact test. No passenger-side score has been issued, but the Beetle gets Good rating for the moderate-overlap crash, as well as for side-impact. Nominally a four-passenger vehicle, the retro-themed Beetle is more suitable for two. The backseat is definitely snug. Overall, the still-quirky interior has aged more than the Beetle’s body. Details aren’t quite as impressive as the overall effect. Coast ($23,120) adds a sunroof, heated front seats with lumbar support, upgraded cloth upholstery, 6.3-inch touchscreen, and blind spot monitoring. An $895 lighting package adds bi-xenon headlights. Beetle SE ($24,020) gets dual-zone climate control and VW Car-Net security. A $2,500 SE option package adds synthetic leather seats, 18-inch wheels, Fender audio, parking sensors, and navigation. Dune ($26,790) has taller ride height and includes sport seats, leatherette/cloth upholstery, bi-xenon headlights, and parking sensors. Immediately recognizable by nearly everyone, including youngsters, the Beetle relies largely on its iconic profile to keep attracting buyers. Even after two decades in its current form, with few dramatic modifications during that entire period, Volkswagen’s truly idiosyncratic model continues to attract notice. Beetle sheetmetal is actually rather plain, unmarred by bodily creases or nonessential detail work. Lowering the roofline on the current generation was thought to give Beetles a somewhat less feminine demeanor. Not only is the roof sleeker than the one on earlier models, the overall profile isn’t quite as circular in shape. Even so, all the familiar hallmarks remain, including rounded fenders and headlights. Inspired by the old Baja Bug, Dune models feature taller ride height, as well as unique body-color choices. Front/rear fascias are distinctive, as are pronounced black wheel arch extensions. Except for newly optional Teal color, the new Coast model doesn’t look or behave appreciably different from its mates. Though the aging, straightforward retro-look layout is still appealing, it’s diminished by subpar materials. Lengthy stretches of lackluster black plastic, which appear thin, are particularly uninviting. In contrast, Beetles benefit from good infotainment systems. Front-seat occupants enjoy abundant legroom, with wide seat cushions that promise long-haul comfort. Hardly anyone will be comfortable in the snug back seat, which offers only 31.4 inches of leg space, and feels even smaller. Convertibles are a bit better, especially in head space, but legroom remains cramped even for passengers of shorter stature. Cargo volume in hatchbacks totals 15.4 cubic feet, expanding to 29.9 cubic feet with seatbacks folded. That’s relatively spacious for a car in this class. In-cabin storage includes several cubbies and a dashboard bin. Outward visibility is generally good, but the rear view in convertible may be obscured when the fabric top is down. In any form, the Beetle looks, and is, ready for fun. Enthusiasts may not be thrilled by its performance; but otherwise, Volkswagen’s iconic model is a pleasantly competent small car. Though larger in displacement than its 1.8-liter predecessor, the 2018 engine produces only 4 more horsepower (now rated at 174 hp). We have not yet driven a 2.0-liter model, but it’s closely related to its predecessor, retaining the same engine block. Therefore, the 2018 version should perform and behave just about identically. Specifications suggest just one notable difference: when pushing the gas pedal, power should arrive at slightly lower engine speed. Volkswagen’s 6-speed automatic transmission promises smooth shifts, though it won’t perform like the dual-clutch automatic that accompanied the now-defunct R-Line engine. Ride comfort is smooth and compliant. Because the Beetle’s suspension is unchanged, it should again feel somewhat soft-riding. Even so, body roll isn’t excessive when a coupe is cornering. Any model can be fun to drive, though devoid of sporty responses. Feedback to the driver is somewhat lacking, from both the steering and braking systems. As expected, convertibles are slightly heavier than coupes, but overall feel should differ little. Dune models are a tad taller-riding, but provide no off-road, four-wheeling capability. Both the coupe and the convertible are EPA-rated at 26/33 mpg City/Highway, or 29 mpg Combined. Dune versions are slightly more efficient, EPA-rated at 26/34 mpg City/Highway, or 29 mpg Combined. In addition to endearing qualities and inevitable cuteness, Beetles come with impressive standard equipment at each level. Performance may fall short, but Beetles promise relatively strong value in the small-car class. Buyers get still-distinctive style, comparative fuel-efficiency, a potential for driving fun – plus one of the best warranties around.